Over the course this year so far, you've seen my adoration for a certain button up sewing pattern (McCall's 6649 - now out of print) and then a couple of hacks of things I've made from it (here and here). I thought I would take a sec, stop down and say a little more about it. It's exciting. Well, at least I think so. Hopefully this post will help clear up some questions I've been getting and hopefully it will show you that you can take a pattern and hack it up and not have to re-invent the fitting wheel. This is a skill I've cultivated over several years and one that is well worth the time invested and when you get to the pattern drafting part, it's really quite fun to learn (in like a scrapbooking sort of way!). In my recent hack of my beloved McCall's 6649, I mentioned a Craftsy class I had taken. One Pattern, Many Looks with Sarah Holden. I enrolled in the class last year sometime and then it sat in my Craftsy cue for many months. One night, I was really tired and decided to watch this Craftsy class as I was sitting in bed. I watched all the episodes right there and then. I was riveted and I was so excited to get up and get started in the morning. Dreamt of pattern hacks all night! Yessssss! The class takes you through this pretty fascinating process. First you're supposed to fit the pattern. This process actually took a few weeks (the longest part of this whole business) because I wanted something that truly, was perfect and that usually means, for me, that I work out any and all kinks in a pattern by making it up at least 3 times. Seriously, 3 times is the charm. I have some more thoughts about the fitting process in my next post, but yeah, I made this shirt up a good 3 times (and then one more time, making that 4 times!!) before I moved on to the rest of the content of the class. Update: Just so you are aware, this Craftsy class does not cover anything about fitting! It's only about pattern drafting and manipulation. After a perfect fit, then it was time to reverse engineer the pattern back to sloper form. What is a sloper? In the most basic terms, a sloper is a base pattern, without seam allowances, from which other patterns can be created or hacked from. You can have different types of slopers. For example, you can have bodice, sleeve, dress, pants, etc. From there you can even have varying types of those basic patterns like a button-up shirt sloper or a raglan sleeve sloper. The idea is that you'll start forming an entire collection of base patterns that are closer in idea to what you want an end pattern to be. More colors in a crayon box if you will. Anyway, back to McCall's 6649. I created a sloper from this pattern and transferred all of the pertinent markings to posterboard. All of the seam allowances have been cut off here and there are holes and notches in specific places. Putting a pattern like this on posterboard is fantastic because then when I'm ready to create a new top from this pattern, I can just trace it off in a matter of seconds. The posterboard is stiff so you can just trace around it really easily. In the Craftsy class, Sarah shows you some really great hacks. And these are just starting points. I mean you really do have the entire world at your feet when you start creating your own patterns - from patterns that already fit you! Since you've already addressed the fit, that tends to not be a problem anymore. You might run into some issues here and there, but they are minimal by comparison. All in all, I'm very very pleased with how my hacks have turned out from this process. It took a lot of time, but was well worth the investment. Onward and upward from here. Have you gone through this process before? What kinds of slopers do you have? If you haven't, I can't recommend something like this enough. 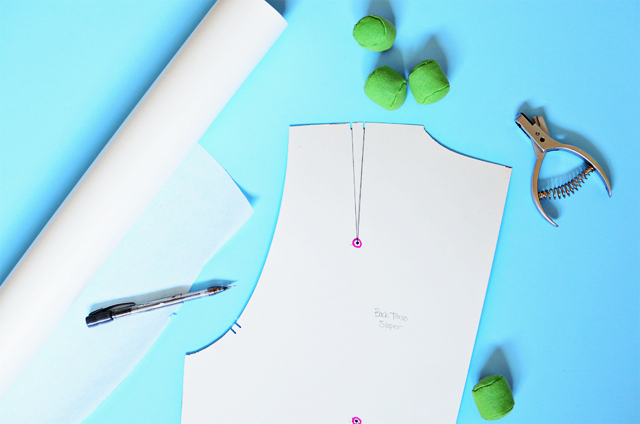 You learn a ton about fitting and about your body and what things you should be looking out for when you go to try a new sewing pattern. Plus then there's the creative gratification that comes from creating a pattern of your very own. Fun, fun! Thank you! I've had that class in my Crafty listing for ages and never "found" the time to watch it. I am watching one class each morning this week. This is exactly what I want to do!Thank you! I've been interested in learning the sloper approach to sewing/pattern making and have been looking at books on slopers I could buy, but reviews seems to often be mixed on their quality, so I've been eyeing the bodice sloper class on Craftsy and the one you've mentionned (amongst so many others, I want to get them all..). It's good to know I'll get my moneys worth for the Many Shirts class when I buy it. I made some shirts in the past, but I see much room for emprouvement and would love to get (or make) a TNT shirt pattern. I've taken the sloper class on Craftsy, but this one seemed really interesting as well. The theory behind it sounds pretty fascinating! I like the concept of a sloper, but I just don't wear too many shirts, so I overlooked this class. I will take another look. Thanks, Sunni! I have a pants and a skirt sloper. I have really worked on the ginger jeans and archer shirt patterns into my idea of perfect jeans and button up patterns. They aren't slopers but now I am curious about doing that. I really believe in taking the time to fine tune patterns , it has been totally worth it for me. I got really tired of reinventing the wheel each go around with mixed results. Perfect timing on this topic! I was just doing some fitting through a new craftsy class (not the one you've mentioned but I will be checking it out now) and wondering if I could apply my new form fitting pattern as a sloper of sorts. Thanks for the insight. Amen! I hear ya sister! Trying to fit new sewing patterns gets so old. Gosh, I got so sick of starting at square zero everytime I wanted to make something a little different and so, it really was finally time to get some slopers done. They are a lot of work, but in the end, I'm so much happier with how these work instead of trying to fit a new sewing pattern. I have to weigh in because I've purchased several patternmaking books over the course of several years. While they are all good and they have wonderful information, drafting a sloper from your measurements is well, just as hard as getting a pattern to fit you. It's about a ton easier if you have a teacher there to help and hold your hand a bit, but if you're doing it on your own, I definitely say, take the Craftsy classes. It's so much easier to be guided by someone than try to decipher how to do it on your own! You'll go through about 1000 iterations of just the drafting trying to get it right - at least I did. I tried many, many different methods and books and found the same for all of them. Almost easier to just fit a sewing pattern from scratch. I think you would be glad you did once you were done. I've been taking my sloper out a TON and playing around with different ideas for different blouses from it - even dresses! It's getting a ton of play and use from me. I think the sloper class would be well worth the time - also have that one in my cue. I found this class really approachable. I like that she used a regular sewing pattern and then took that pattern and created a bunch of different blouses from it. It's really creative and fun! So many possibilities. I think there's one for pants too if I'm not mistaken. A Craftsy class I mean. Same idea. You take a pair of pants and create all the different pants patterns that you want from a single pattern. Makes it so you don't have to deal with fitting a new pattern. It's quite liberating and fun! I'm sure you can. Fitting is the #1 reason people don't sew their own clothes. When you start taking the fit out of the equation, it makes you want to sew more and believe me, you do! You can start cranking out patterns and projects left and right. I truly miss wearing shirts with buttons. Or even a shirtdress as the retro look is coming back. But my bust has a fuller shape from the sides so all RTW blouses get the gappies on me. Honestly, why sew a shirt I have to keep closed with safety pins? This class is in my Crafty wish list but haven't taken the plunge yet. You've convinced me now that I may find my answer here. The idea of perfecting a pattern sloper has been brewing so I think on their next sale I'll get it. On a side note, I mentioned you and your Crafty class on zippers in my latest blog post. I reference that class ALL the time. Can you do a post about a dress with a lining and an invisible zipper? One that has that nice machine finish? Since I drafted my bodice, skirt and pant sloper from the book European Cut by Elizabeth Allemong, they have been invaluable to achieving fit that is 95% right the first time. The other 5% is the vagaries of the pattern and fabric I'm using which can be dealt with, with a muslin and then I'm good to go to make multiples :) I also use RTW items in my wardrobe to compare then tweak the patterns. I'm sure I could come up with something! Give me a bit and I'll see if I can't put this together! As for the Craftsy class I'm talking about here, I do want to state that it's not a fitting class by any means. 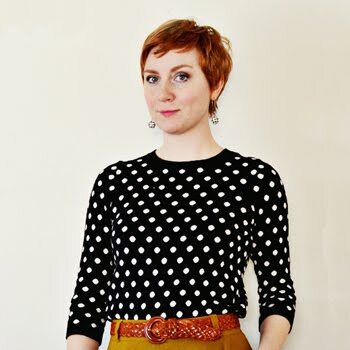 Sarah Holden only talks and goes into depth about pattern drafting. But I still think the class would be worth everyone's while. The pattern drafting alone is great and it really does get you to think outside the box. I know exactly what you mean about wearing button-up shirts. I never did for a long time either because they never fit across the back. Couldn't put my arms in front of me! Now I can that I make my own. It's marvelous! Yes, I'm completely on board with you here! I feel the same way about the fit and I usually tend to make a muslin, if only just to check things like the neckline and such. Otherwise, the fit is so much easier and all I have to worry about is the design. Fun! I don't remember her using a lot of measurements, but sadly they are in inches. So sorry! We definitely need to convert over to the metric system! ugh! Someday I'll get to only 3 tries before fitting! It took me 8 Sorbettos before I got one that fit. Three sounds like a lovely goal! I am honestly still a little scared of the idea of a blank slate. I'm not familiar enough with my body and how clothes fit it yet to be able to envision something. I do look forward to that time, though, because frankly, I also find it hard to envision something from a pattern fitting me. It helps to troll the internet for someone similar to my body shape who has made the pattern, but it's still a wee bit exhausting. I have just finished fitting and putting together a dress sloper. But I don't know what to do with it now. Take it apart and trace it? Keep the darts closed? I used Vogue dress sloper pattern and really all it does is tell you to keep fitting it, but how do I use it against other patterns so that I will know they fit? This thing was a lot of work and I don't know how to use it now. Let me know if you have information on where to go from here. Hi Haze! Some great questions here. Hopefully I can answer them and give you some insight. The concept of using your sloper up against another sewing pattern to diagnose the fit before you make it is, well, a hard one. Additionally, I personally feel - since this is a method that I have tried - that it is full of holes and you end up still have to make a muslin and work out some fitting issues. If you are hell-bent on this method, I recommend Lynda Maynard's book Demystifying Fit. I would say that if you do want to do this method then you do need to take your muslin apart and copy it onto paper. You'll need to do this if you want to create sewing patterns from it, so I recommend that you do that step. If you want to create your own sewing patterns - which I find to be a much superior method to trying to use it to fit other sewing patterns - then I would recommend the Craftsy class above to give you a taste of how this works. You could still use your bodice section for most of the designs in the class or take the ideas and apply them to your sloper. There's also a book called, Design Your Own Dress Patterns by Adele Margolis that is excellent and can take you through how to hack up your pattern to be something different. Hopefully this gives you a little direction! 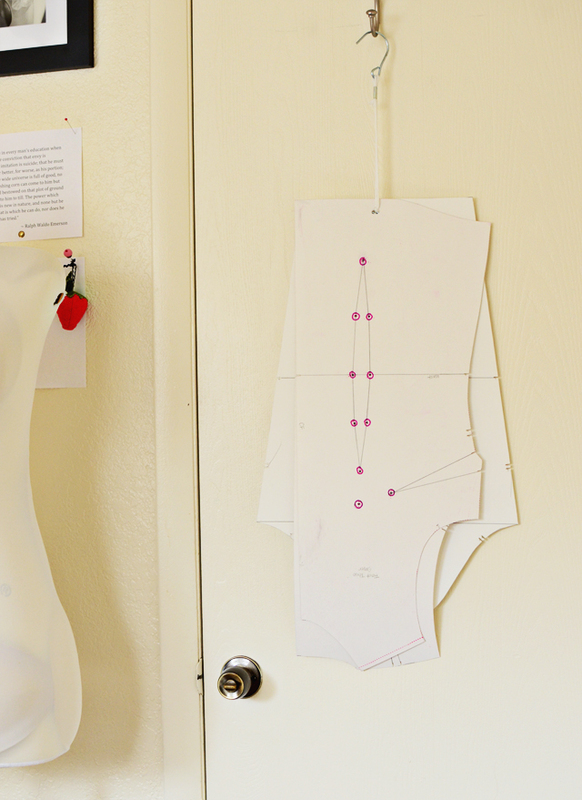 I loved Sarah's class, though I stopped part way through to focus on Patternmaking Basics: The Bodice by Suzy Furrer. I have drafted and redrafted my bodice sloper so many times now that I've lost count! I'm trying to get a perfect fit (I'd like to say couture but my skills aren't that good). It's really nice to see other sewers who are working on the same things as me.